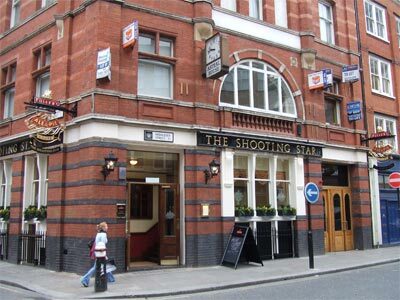 After a few weeks refurbishment The Shooting Star re-opened on 3rd of April 2007, a lick of paint inside and out, some new light fittings have spruced up the place giving it a fresh feel, although Fullers didn't take this opportunity to introduce no smoking. The London Pride on that opening night was one of the best pints I've had in the City, very enjoyable, as part of the celebrations nibbles were on offer, mainly ceche and sandwiches, very pleasant indeed. The pub itself is a good size, there is plenty of seating all around and even a couple of lounge sofas up near the bar. A function room is available downstairs, although I didn't venture that way. The overall style is very much as you would expect from a Fullers pub, traditional, pleasant and relaxing. From the sixty year period between 1896-1956 this building was occupied by the Jewis Board of Guaridans.